Definition at line 46 of file llfloatergroupinfo.h. Definition at line 98 of file llfloatergroupinfo.cpp. Definition at line 85 of file llfloatergroupinfo.cpp. Definition at line 163 of file llfloatergroupinfo.cpp. References FLOATER_TITLE, get_if_there(), NULL, LLFloater::setTitle(), and sInstances. Definition at line 103 of file llfloatergroupinfo.cpp. References LLPanelGroup::canClose(), mPanelGroupp, and TRUE. Definition at line 144 of file llfloatergroupinfo.cpp. Definition at line 131 of file llfloatergroupinfo.cpp. References LLPanelGroup::close(), get_if_there(), mPanelGroupp, NULL, and sInstances. Referenced by closeCreateGroup(), LLAgent::processAgentDropGroup(), and LLGroupMgr::processLeaveGroupReply(). Definition at line 67 of file llfloatergroupinfo.h. Definition at line 150 of file llfloatergroupinfo.cpp. References get_if_there(), mPanelGroupp, NULL, LLPanelGroup::refreshData(), and sInstances. Referenced by LLGroupMgr::processEjectGroupMemberReply(), LLGroupMgr::processJoinGroupReply(), and update_group_floaters(). Definition at line 113 of file llfloatergroupinfo.cpp. Definition at line 125 of file llfloatergroupinfo.cpp. Definition at line 177 of file llfloatergroupinfo.cpp. 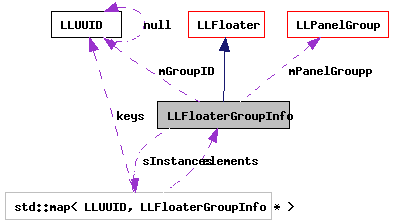 References callbackLoadGroupName(), LLFloater::center(), FGI_RECT, FLOATER_TITLE, gCacheName, LLCacheName::get(), get_if_there(), LLFloaterGroupInfo(), LLUUID::notNull(), NULL, LLFloater::open(), selectTabByName(), sInstances, and TRUE. Referenced by group_vote_callback(), LLGroupHandler::handle(), LLPanelGroups::info(), join_group_callback(), LLFloaterIMPanel::onClickGroupInfo(), LLGroupNotifyBox::onClickGroupInfo(), LLPanelGroupGeneral::onClickInfo(), LLPanelPermissions::onClickOwner(), LLFloaterProperties::onClickOwner(), LLPanelLandGeneral::onClickProfile(), LLPanelAvatarSecondLife::onDoubleClickGroup(), LLPanelLandObjects::onDoubleClickOwner(), LLFloaterLandHoldings::onGrantList(), LLGroupMgr::processCreateGroupReply(), showCreateGroup(), and showMyGroupInfo(). Definition at line 119 of file llfloatergroupinfo.cpp. References gAgent, LLAgent::getGroupID(), and showFromUUID(). Definition at line 208 of file llfloatergroupinfo.cpp. 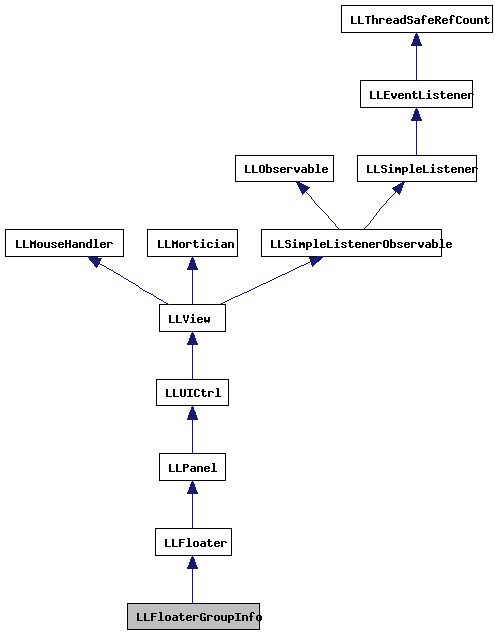 References get_if_there(), inventory_offer_callback(), IOR_DECLINE, LLUUID::isNull(), llendl, llinfos, mPanelGroupp, NULL, LLPanelGroup::showNotice(), and sInstances. Definition at line 81 of file llfloatergroupinfo.h. Referenced by getGroupID(), and ~LLFloaterGroupInfo(). Definition at line 82 of file llfloatergroupinfo.h. Referenced by canClose(), closeGroup(), LLFloaterGroupInfo(), refreshGroup(), selectTabByName(), and showNotice(). Definition at line 79 of file llfloatergroupinfo.h. Referenced by callbackLoadGroupName(), closeGroup(), refreshGroup(), showFromUUID(), showNotice(), and ~LLFloaterGroupInfo().